Geospatial Ontology Of Agricultural Regions: An Exercise In Knowledge Engineering. A new article! The article offers an overview discussion of the geospatial ontology and history of agriculture regions. Afterwards it presents some methods for geospatial ontology development with focus on globally distributed agricultural regions. This ontology may be useful for governing bodies in environmental monitoring or environmental decision-making on a national scale. The purpose of ontology (“an explicit specification of a conceptualization”) is to increase the understanding of the semantics in a domain for computers and to increase interoperability between data sets. On its turn, a geospatial ontology is a formal conceptualization of the spatial relationships of geographic phenomenon. This kind of ontology is the intersection of the regular functions of ontologies with feature components and relations to the standard GIScience feature representations of coordinates, topology, and attributes. The article describes research project that explores the challenges of creating a conceptualization (ontology) of a social geographic phenomenon as it pertains to GIScience’. This ontology takes a top-down approach using semantics identified from Derwent Whittlesey’s agricultural region classification scheme. In order to hold significance for the precision farming and best-practice agricultural management there is a need for the collection, organization, and exchange of agricultural data. To achieve this, the author outlines the relationships of the defining characteristics of each farming system for increased geospatial data interoperability amongst agricultural stakeholders. 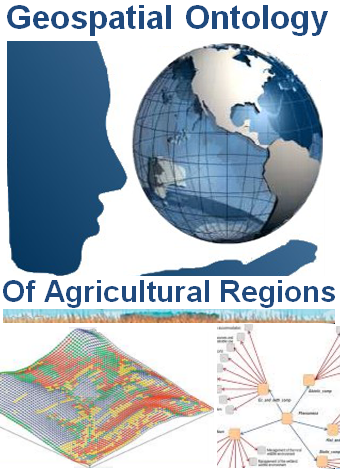 The main focus is to build a functioning geospatial ontology (a growing topic of research in GIScience field) for global agricultural regions, to increase semantic interoperability on three levels—search, querying, and integration encompassing the processes of semantic enrichment (reconciling semantic heterogeneity by adding semantic information to a data set) and mapping discovery. After a literature review of geospatial ontology literature and agricultural system classifications (FAO’s Agricultural Ontology Service is comprised), the author identified the Whittlesey classification scheme as the most comprehensive classification by spatial characteristics. This one has eleven concise categories for different agricultural regions that spanned globally and took into account both livestock and crop cultivation variations. Afterwards the vocabulary (terminology, concepts) and relationships (with assigned domain, range and type) - associated to the chosen classification (i.e. to superclasses and subclasses) - were selected and organized. The classes were defined following the semantic subject-predicate-object type definition. The author referred to two ontology construction tutorials: Ontology Development 101 (A Guide to Creating Your First Ontology) and A Practical Guide to Building OWL Ontologies Using Protégé 4 and CO-ODE Tools as well as to the best practice guidelines outlined by the semantic web. Then using Stanford’s Protégé 5, the author built the ontology (with classes and subclasses) in the standard web ontology language (OWL). Finally queried testing and visualization were performed setting up the OntoGraf tool to visualize the classes, subclasses, and the object properties between them. The resulting ontology is the skeleton (with 71 classes and 15 object properties, 216 logical axioms, 0 data properties, and 0 individuals) for a comprehensive upper-level geospatial ontology of agricultural regions. Each region has an assigned (according to a mereotopological approach) location, mobility, spatial extent, country, and landscape value. The described user-friendly ontology of agricultural regions is not universal but rather creator’s conception of the defining spatial characteristics of varying types of farms. The ontology has answered questions like: What is a farm? How is a farm differentiated from other landscapes on the Earth’s surface? The resulted ontology has no data properties. Any sort of numerical spatial data – that the author was able to find (from the FAO or US Census) – did not follow any type of standardization upon values for what is a large farm globally. The author would recommend future ontology (knowledge) engineers explore multiple options in their architecture and construction, especially when building formal domain level ontologies, setting a strict question guide. According to the author, “Future geospatial ontologies would be most beneficial if they were interoperable with the FAO ontology of soils for remotely sensed data and included spatial characteristic definitions identifiable in remote sensing”. We would be very pleased to hear from you about your ideas and experiences in ontology development for agricultural domain !